There are a lot of Halloween themed slots out there, so Peek-a-Boo will certainly have competition. That being said, the slot is good enough to surpass its rivals, so there’s no reason why players shouldn’t give it a run for its money. 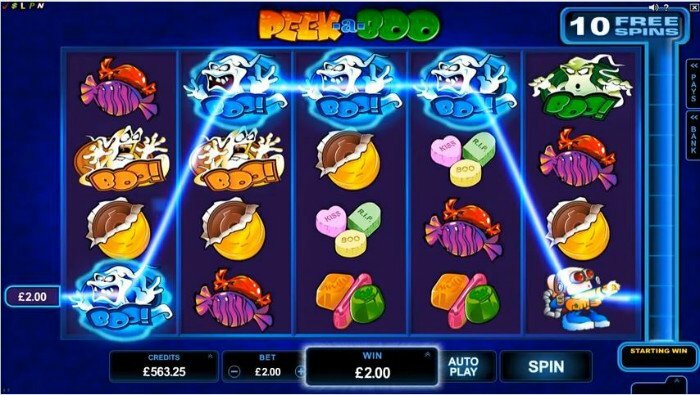 Peek-a-Boo has been designed as a Halloween themed video slot, even though it is available throughout the year. The slot features 5 reels and 40 paylines, which is unusual for Microgaming. This Peek-a-Boo slot review will focus on the superb special features you can find in the game, but for now, let’s check out its imagery. The Peek-a-Boo graphics are commendable. The game contains candy symbols aplenty, as well as a dozen ghoulish ghost symbols. The most unique of these is the kind of Ghostbuster symbol which appears on the reels on occasion. The Peek a Boo game contains a very unique set of symbols, and it needs to because this game has a very unique structure, which we’ll come to shortly. Players are not going to have everything their own way in the Peek a Boo slot machine. For starters, you won’t be able to adjust any of the paylines which feature in the slot. You can, however, select coin values of 1p up to £1 in total. You can also stake up to 10 of these coins per spin. At its cheapest, this slot will cost 40p a spin. At its most costly, it can set you back around about £400 a spin. 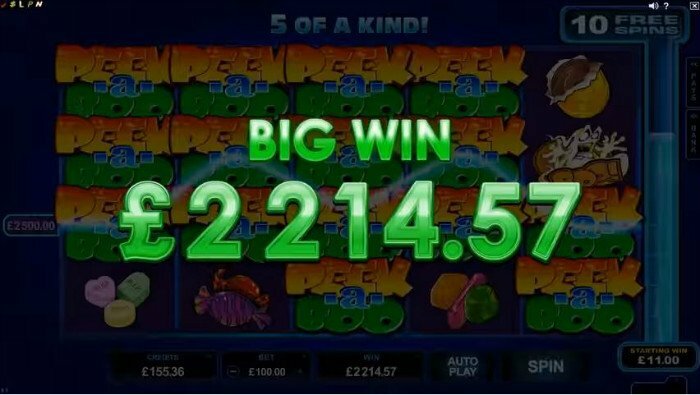 It will hardly have escaped your attention that a free spins counter is located down the right hand side of the reels. If you manage to land the ghost zapper man on the third reel, and ghouls on other reels, he will zap them. He can only zap one at a time, though. Every time you zap a ghost, the metre to the right of the reels rises. Once the player has zapped 10 ghosts, a free spins bonus game is triggered. This ghost zapper icon is capable of appearing on all of the reels of the game to hand out prizes. Remember, he can only zap ghosts on the third reel. This ghost zapper icon also serves as a paying symbol. Another one of the Peek a Boo slot bonuses is a wild symbol. This wild takes the shape of the game slot logo, and it can replace all other symbols save for scatters. During the base game, this symbol is capable of appearing stacked on all of the reels of the slot. The main bonus round is the aforementioned free spins feature. 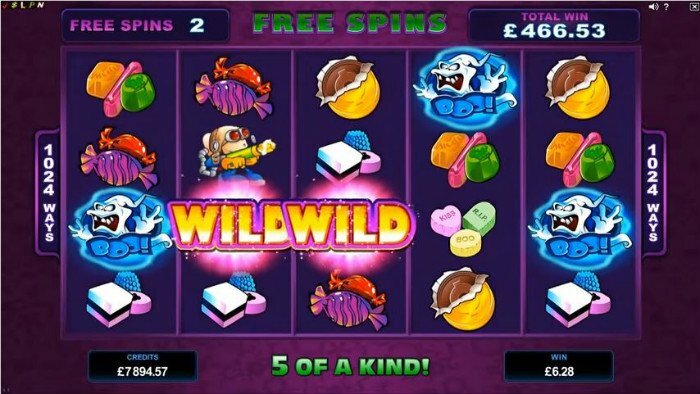 Players will start with a total of 1 free spins, and during this bonus, all wilds appearing on the fourth and fifth reels will be super stacked. There’s more treats to be had than that, though. The Peek-a-Boo slot bonus round will also see you able to play with 1,024 ways to win, instead of the default 40 paylines. You can even enjoy fourth and fifth reel re-spins in this bonus. Land a 3-symbol winning combination and the fourth and fifth reels will re-spin. Land a 4-symbol combination and the fifth reel will re-spin. The Peek-a-Boo slot has the potential to be a success whether it happens to be Halloween or not. Microgaming have equipped it with enough features for it to be positively good fun, however it is not the most flexible slot on the net. There are a lot of Halloween themed slots out there, so Peek a Boo will certainly have competition. That being said, the slot is good enough to surpass its rivals, so there’s no reason why players shouldn’t give it a run for its money.